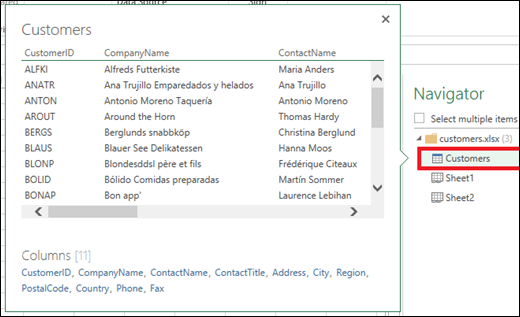 Use Excel's Get & Transform (Power Query) experience to connect to an Excel workbook, a text file (.txt), or a Comma Separated Values (.csv) file just like you would connect to any other data source. The Power Query editor gives you a great deal of flexibility with how you get and transform your data. Click on the Data tab, then Get Data > From File > select From Workbook, or From Text/CSV. If you don't see the Get Data button, click on New Query > From File > select From Workbook, From CSV, or From Text. Follow the additional steps below. Note: You can also restore the Legacy Connectors to mimic earlier behavior. See the section on "How do I restore the legacy Get External Data experience?" in the following article: Unified Get & Transform. In the Power Query ribbon tab, click From File > From Excel, From CSV, or From Text. Follow the additional steps below. In the Excel Browse or Comma-Separated Values Browse dialog box, browse for or type a path to the file that you want to query. Important: If you are importing data from a CSV file, Power Query will automatically detect column delimiters including column names and types. See importing data from a CSV file. If your source workbook has named ranges, the name of the range will be available as a data set. If you are importing data from a CSV file, Power Query will automatically detect column delimiters including column names and types. For example, if you imported the example CSV file below, Power Query automatically uses the first row as the column names and changes each column data type. In the Query Editor, Power Query automatically applies a FirstRowAsHeader step and ChangeType step. These automatic actions are equivalent to manually promoting a row and manually changing each column type. While trying to import data from a legacy Excel file or an Access database in certain setups, you may encounter an error that the Microsoft Access Database Engine (Microsoft.ACE.OLEDB.12.0 provider) is not registered on the local machine. The error occurs on systems with only Office 2013 installed. To resolve this error, download the following resources to ensure that you can proceed with the data sources you are trying to access. Note: To ensure that you have the full set of features, install the Microsoft Access Database Engine 2010 Redistributableand all service packs. Note: The Query Editor only appears when you load, edit, or create a new query using Power Query. The following video shows the Query Editor window in Excel 2013 appearing after editing a query from an Excel workbook. To view the Query Editor without loading or editing an existing workbook query, from the Get External Data section in the Power Query ribbon tab, select From Other Sources > Blank Query. The following video shows one way to display the Query Editor.